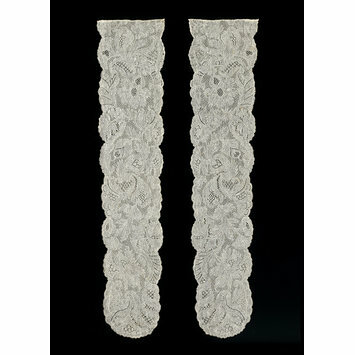 At the beginning of the 18th century, accessories made of finely woven muslin were often the choice of fashionable men and women, although elaborately patterned lace continued to be worn on the most formal occasions. By the 1720s, fashion moved on again. Lace was once more worn by all those who could afford it, but a new style of bobbin lace developed, of great delicacy and refinement, incorporating the soft draping qualities of muslin. It was made particularly in the region around Valenciennes, which although French territory, had a tradition of lace making in the Flemish style, using exceptionally fine thread. Because of the fineness of the thread, and the density of its patterns, Valenciennes lace was very slow to make. It was straight lace, made in a single strip (rather than several sections which could be made by different workers and joined up), and a lace maker might produce just half a meter of the highest quality Valenciennes in one year. 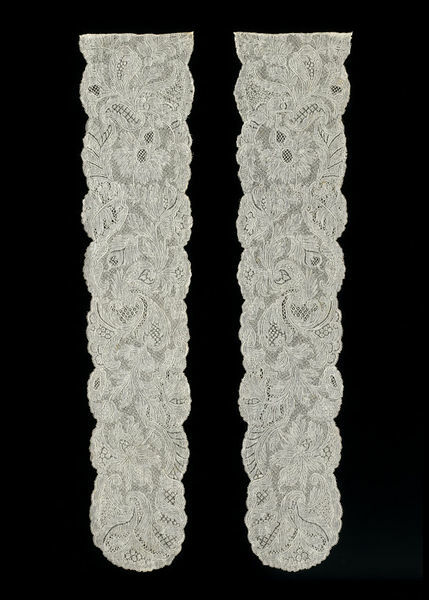 These lappets formed part of a head dress, known as a 'lace head' in the 18th century. It was composed of a curved panel, the cap back, to which two long streamers were attached called lappets. The whole ensemble was finished with a lace frill. 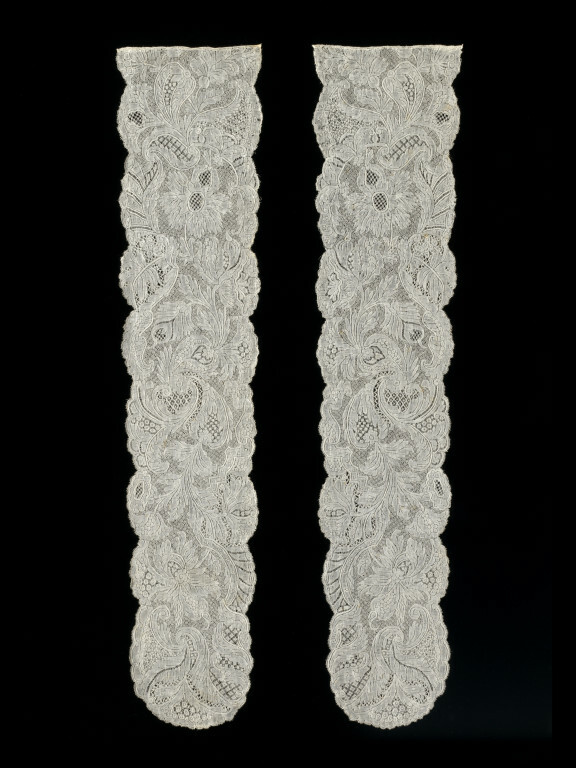 Pair of lappets in Valenciennes bobbin lace. Dense floral pattern with complex fillings. Gently scalloped edges.Top edges cut, with narrow footing attached.